There is a schedule for a QAL in Greece during 2015. Actually the second Greek QAL ever. We are going to make houses. One quilt each participant with 36 houses. 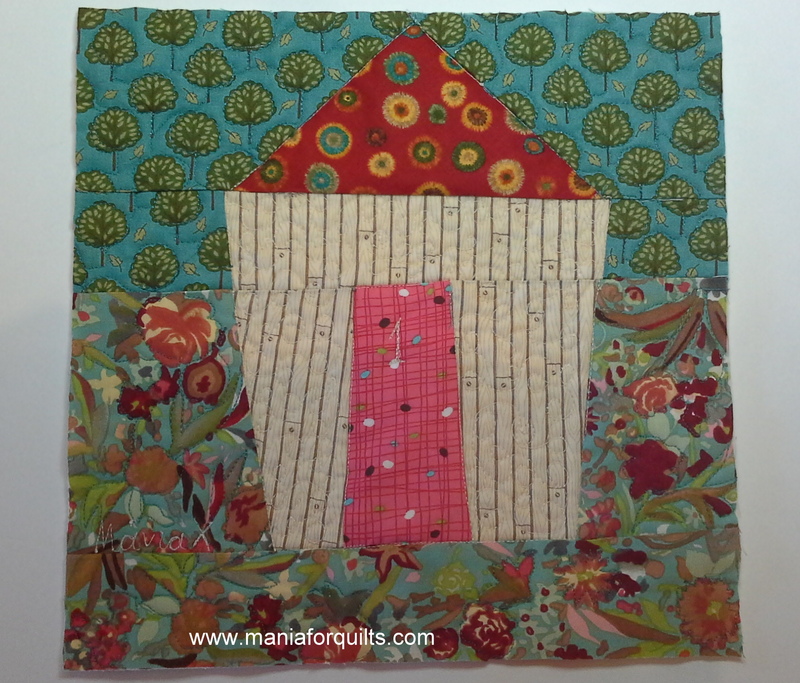 Everyone is sending 3 quilted house blocks to 3 persons every month. At the end of the year, we are going to put them together and have our quilt. 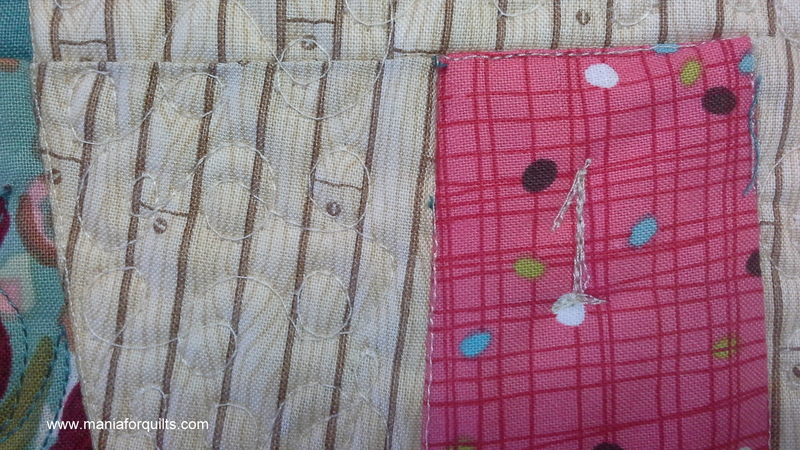 Patchwork and quilting is not very well known in Greece, however it is expanding rather fast. 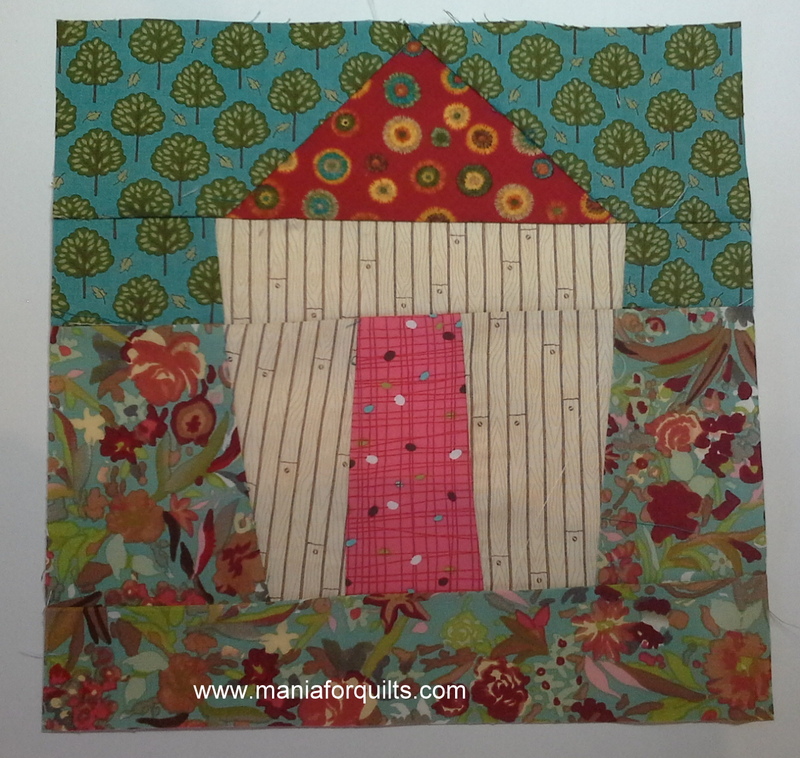 In order to help people with a few tutorials, I am planning to post every week one detailed tutorial about a house-block of 30 cm or 12″. I am posting two different tutorials, in Greek and English. I am starting with a rather easy and versatile technique. It is a technique you may adapt it as you like. Let’s get started! 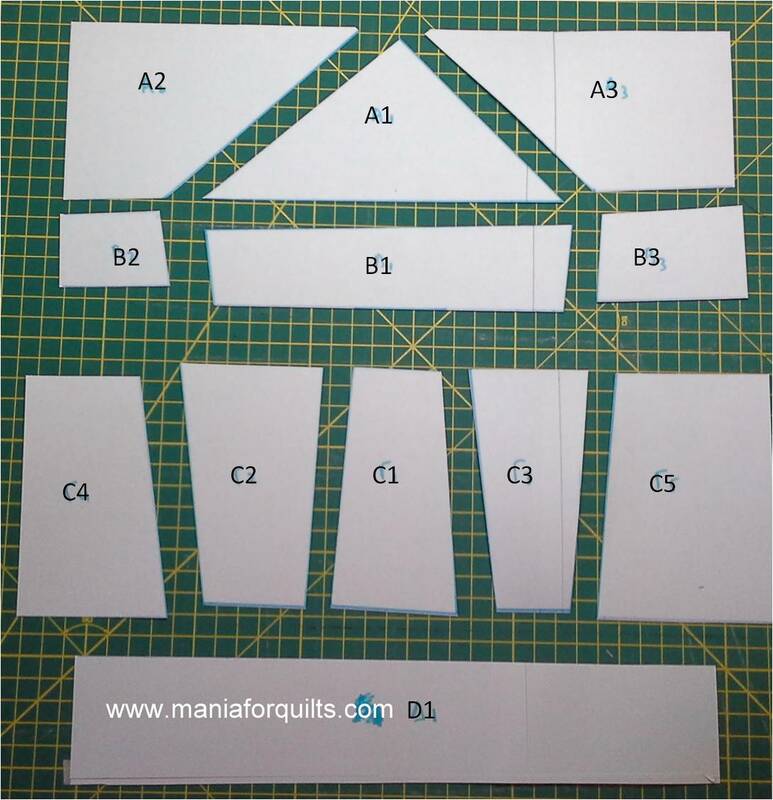 Cut a piece of paper on the desired dimensions 30 cm by 30 cm or 12″ by 12″. 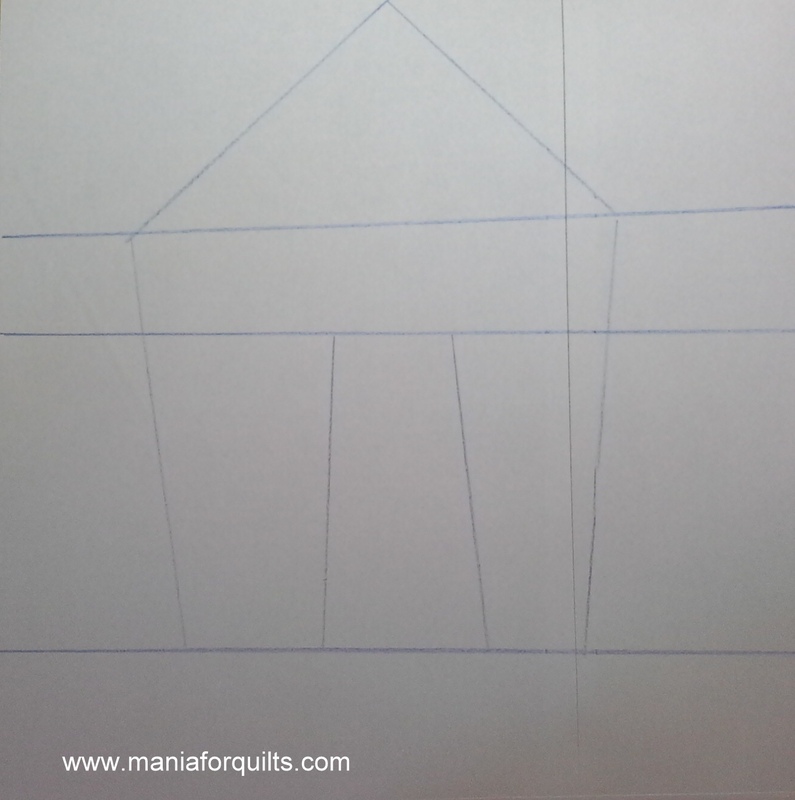 Use your ruler and draw the lines you see on the sketch below (please ignore the vertical line on the right side is the point where the two sheets of paper are joined). You may draw the door narrower or even the whole house or just the opposite. Some of the lines are there to help while sewing. Therefore, take a look at the following sketch to see the house. 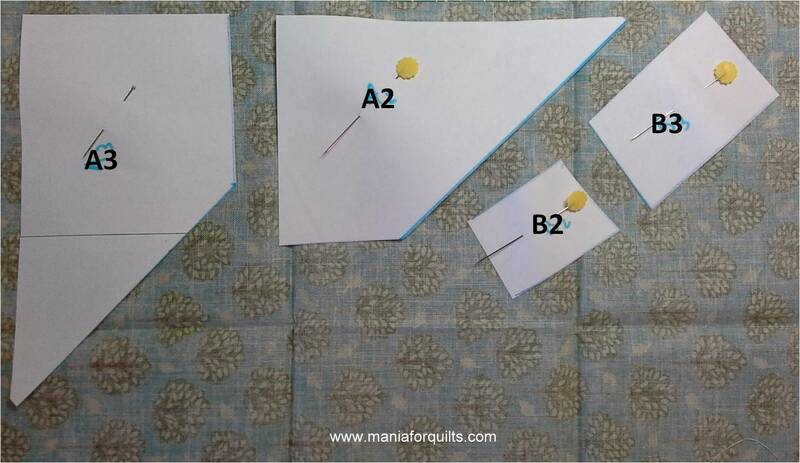 Put a number on every piece as you see below and cut on the horizontal lines. 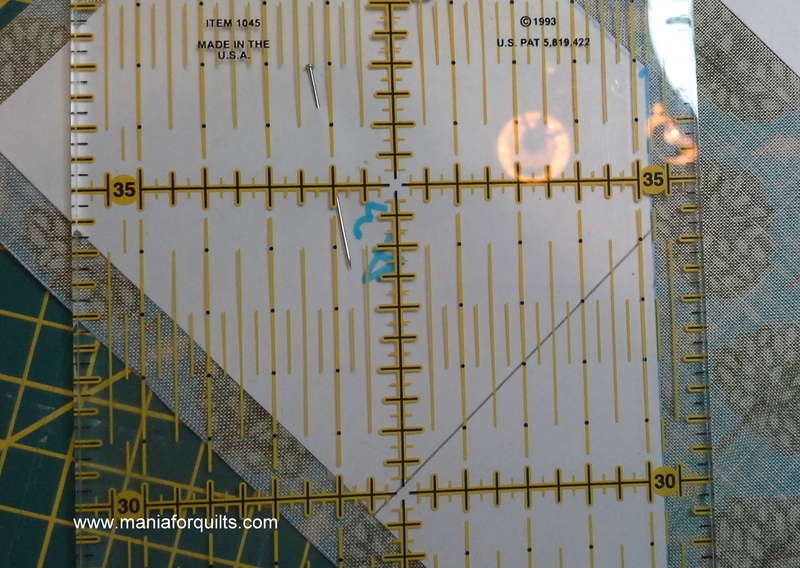 Pin every pattern on the wrong side of the relative fabric. Take care how you put the pattern on the fabric, if the design of the fabric is specific, eg trees. In my case, I did not pay attention and had to cut allover again. 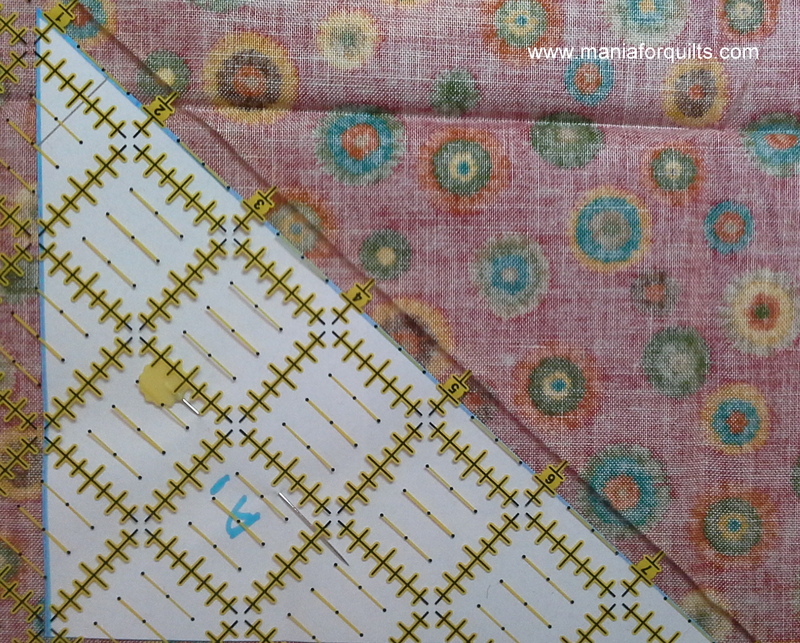 Place your ruler on the fabric indivaring the seam allowance (0,75 cm if you work in cm/ left photo or 1/4″ if you work in inches/ right photo). 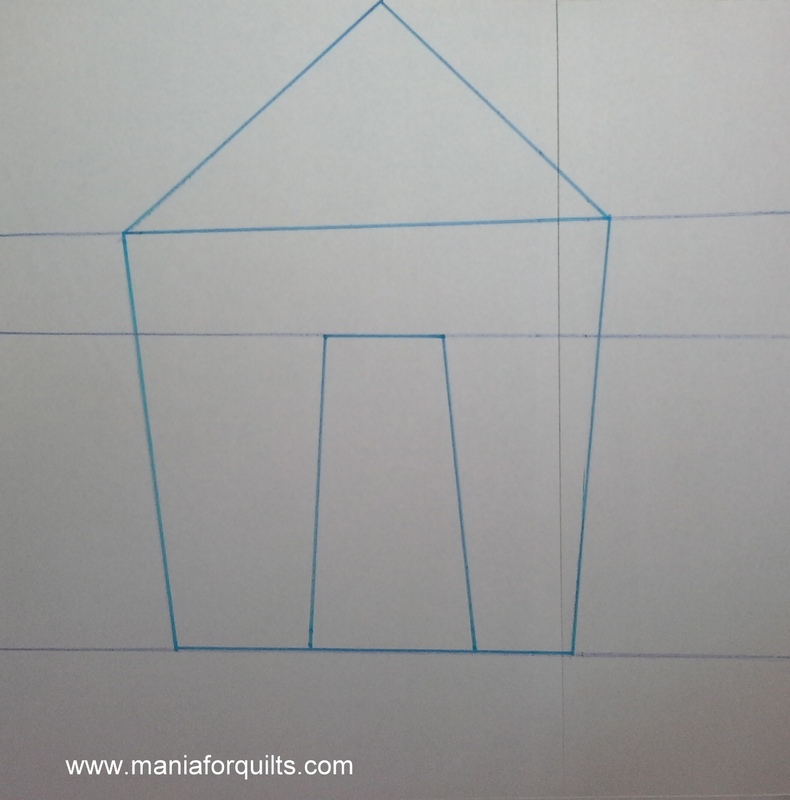 Draw a line with a pencil around the whole shape or cut it at the same time with your cutter. 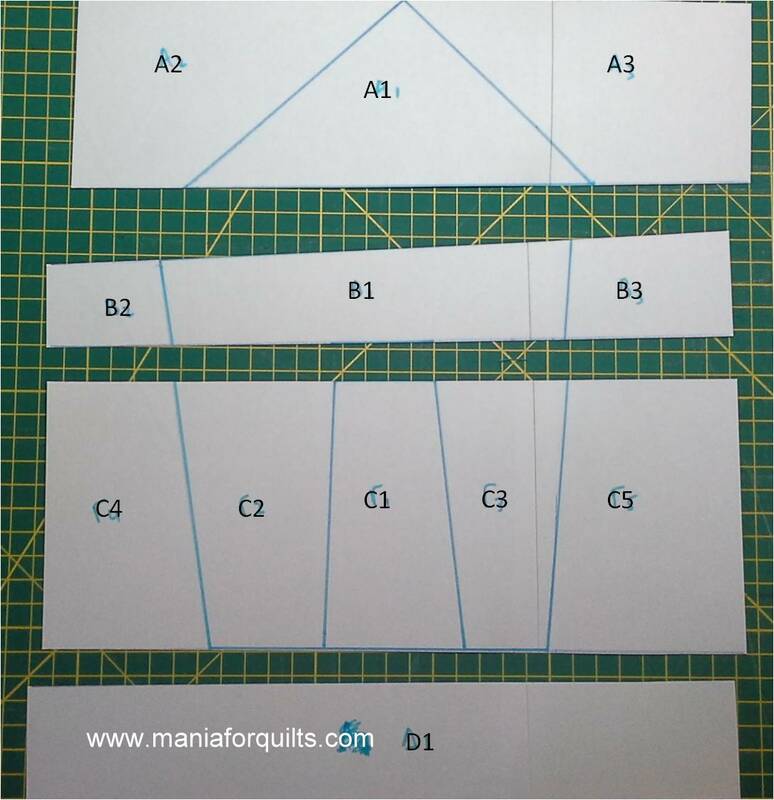 Every shape will be larger than the pattern by the seam allowance. then you may join the pieces according the numbering. Meaning that you join Α1 with Α2 and then Α3. Β2 with Β1 and then Β3. C1 with C2, then C3, C4 and C5. You now have 4 stripes: Α, Β, C and D.
You join A to B, then you join C and lastly D. You trim all sides and voila! You prepare you back side piece and put it right side on the table. You cu a piece of batting and put it on top and then you add the block you have just finished. Yoy firm it in place with pins or safety pins. 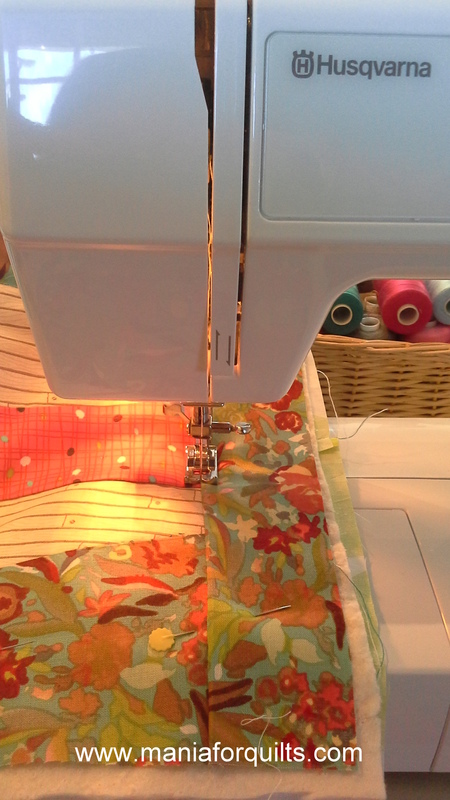 I will describe the quilting I made below: First of all I stitched in the ditch arount the house. I usually use my regular foot. If you have a stitch in the ditch foot, you may use it. With my open toe free motion foot, I wquilted as follows: not at all on the door and on the roof. I made ribbons on the walls, a rough outline on the trees going from tree to tree and rough outline on some of the flowers. 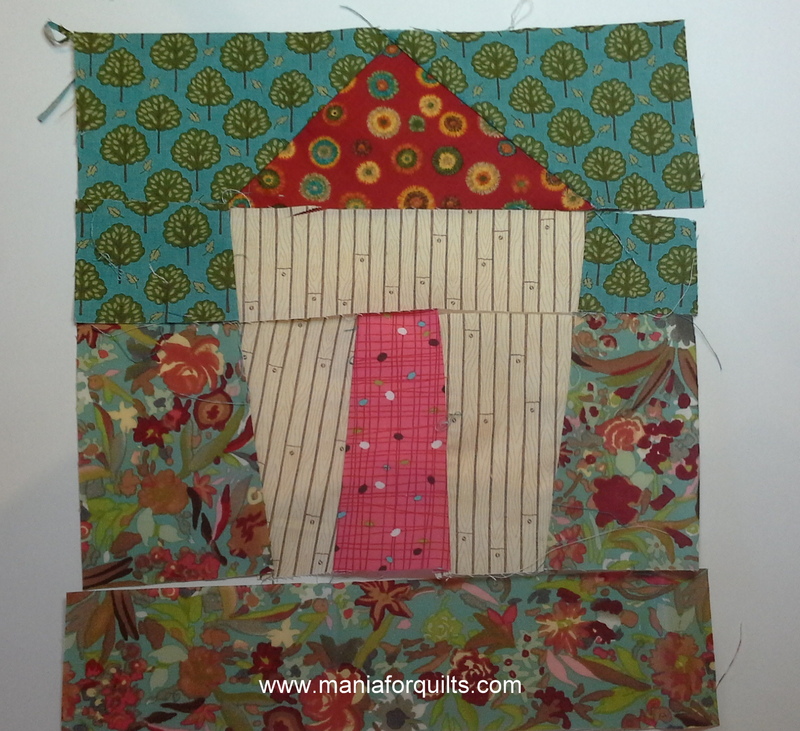 I quilted No 1 on the door, since I decided to put the following number on every next house block I make. 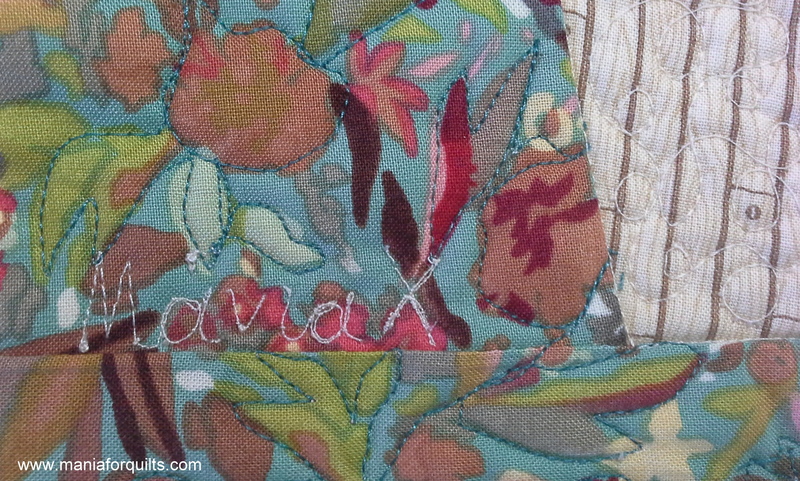 I signed my name while quilting. 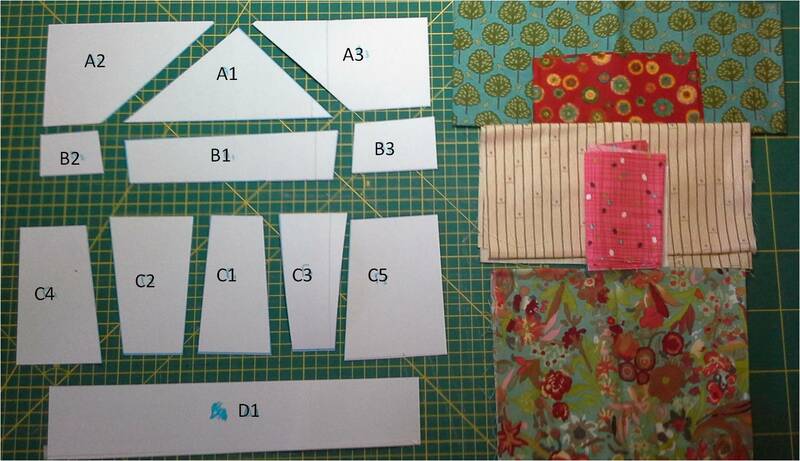 Trim every side and make sure that your block is 30 cm by 30 cm or 12″ by 12″. You ffirst house block is ready. Good luck. I look forward to seeing your blocks.